More road trip food! We picked these up at a Sheetz gas station, along with some drinks. I will say that this was some of the best gas station coffee I’ve had, so if you’re in the middle of Pennsylvania and need coffee, maybe stop there? 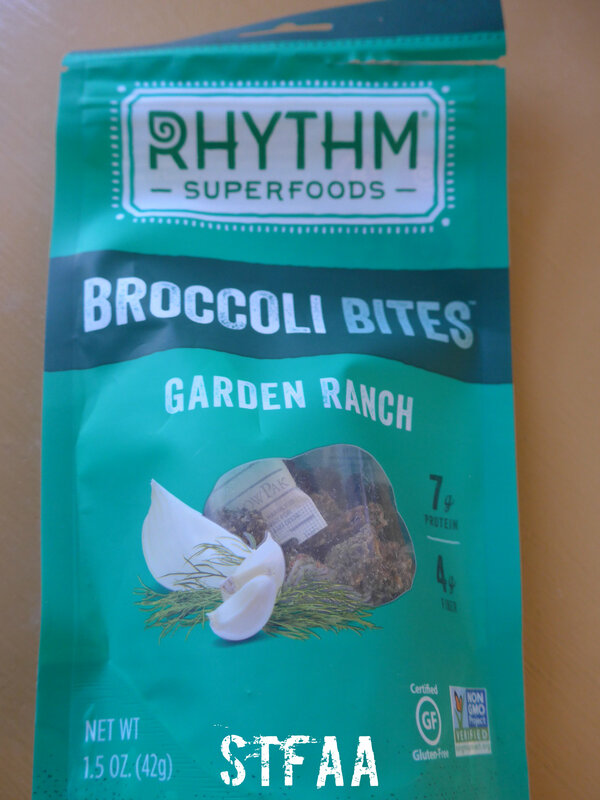 I have not seen broccoli in snack foods very often, but I LOVE broccoli, and needed to try these. Turns out that I didn’t end up trying them until we were home, and I have no outside tasters to weigh in on this. I loved them, though. Ingredients: broccoli, sunflower seeds, cashews, apple cider vinegar, onion, cane sugar, lemon juice, dill weed, sea salt, garlic, white pepper. This broccoli has been freeze dried, maybe? I am not sure. It has much the same flavor as roasted broccoli, but is sort of dry and crunchy (in a good way). The flavoring on them is ranch-ish, but not nearly as powdery and chemical-y as, say, ranch chips. It does, however, have that good salty flavoring that flavored chips or other snacks have, which I have to admit I miss in snack foods. Plus, hey, it’s broccoli and nuts, so it’s totally better than junk food, right? STFAA Review Conclusion: If I can find these locally, this will become a road trip staple.